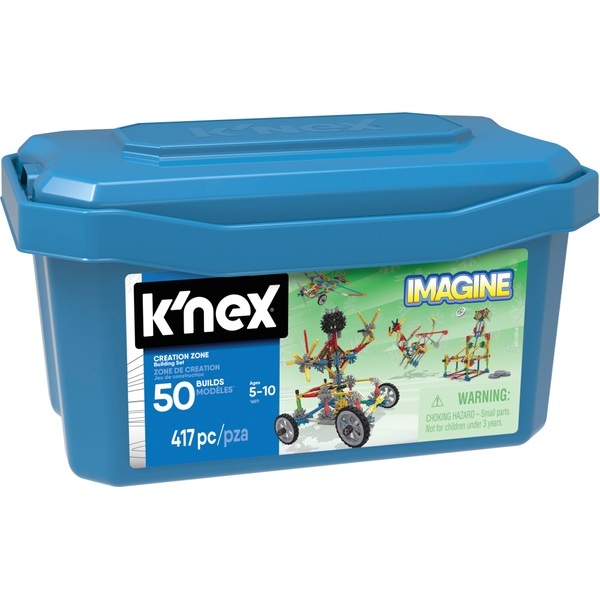 Build and design with the K'NEX Imagine Creation Zone 50 Model Building Set. This Creation Zone set is a great starter kit and includes over 415 micro and classic scale K'NEX rods and connectors to build anything you can imagine. The enclosed step-by-step color-coded instructions can guide the builder with 50 different unique ideas. Builds in the Creation Zone set vary in difficulty so you can build a patrol boat, dragon, school bus and more! And when the builder is done, all the K'NEX rods and connectors can be easily stored in the re-usable plastic storage tub.